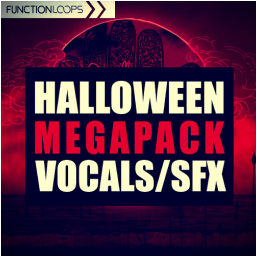 "Halloween Mega Pack" is a collection of 850MB Haloween dedicated material. An ultimate add-on of horrifying voice samples and SFX loops for any kind of production. Fits perfect for all dark genres and beyond. You won't find much of this kind of material around. So, if you were looking for scary content for your music, look no further. All our scary collections in one Mega pack! Everything was recorded at 24-bit WAV quality, 100% Royalty-Free, BPM-Labelled. Take the crowd on a horror adventure with "Halloween Mega Pack"!